Here we include helpful services for artists and art patrons. Whether you need an installer, a conservator, exhibition space, or help with your Open Studio, start here for well-respected resources. 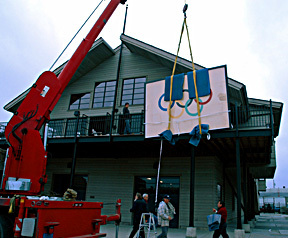 Atthowe Fine Art Services is a full-service company specializing in the safe handling, shipping and installation of large, fragile and valuable fine art. AIC Guidelines for Selecting a Conservator points to keep in mind when choosing a conservator. We are pleased to recommend framers and conservators to those of you needing services outside of the San Francisco Bay Area. Rebecca Pavitt, Fine Art Conservation, British Columbia. In order to find a qualified framer, we recommend that you look for a member of The Professional Picure Framer's Association. (PPFA). Just type your zip code into the search box on the PPFA Find A Picture Framer page and you will be taken to a list of PPFA member framers in your area. In addition, the list below includes framers in various areas of the country. Most are members of PPFA., and many have PPFA Certified Picture Framers (CPF) on staff.